Majoring in chemistry at Clark puts the physical makeup of our world — from nanoparticles to DNA and the elements on the periodic table — under your microscope and into your hands. 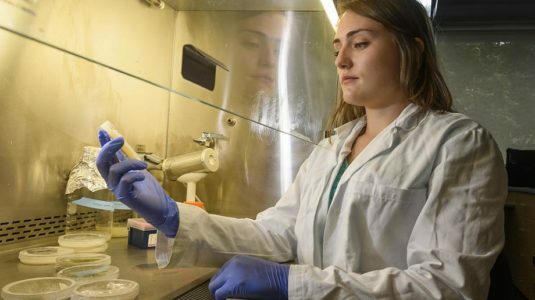 You’ll engage in research as early as your first year and collaborate on new discoveries with leading professors in the field. Chemistry requires a sense of adventure; as you explore the hidden structure and properties of matter, you’ll learn what the world is made of — not to mention what you’re made of. Through hands-on learning, lab work, and internship experiences, you’ll emerge prepared for an adventurous and rewarding career..
Why Study Chemistry at Clark? Conduct research alongside faculty members and doctoral students, using cutting-edge research equipment like our nuclear magnetic resonance spectrometer in our state-of-the-art labs. Customize your educational experience by choosing from the standard track or the American Chemical Society (ACS)-certified track. 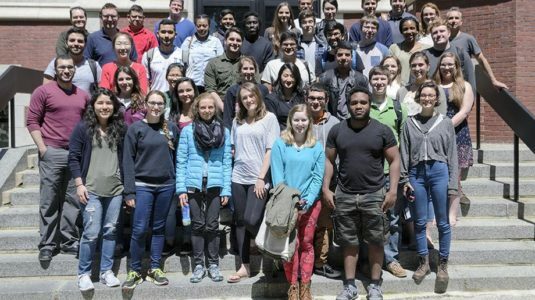 Study with professors who have expertise in a diverse range of specialties, including an American Chemical Society Fellow and a John A. Timm Award recipient (the highest honor given by the New England Association of Chemistry Teachers). The American Chemical Society (ACS)-certified track, which meets the entrance requirements for graduate study in chemistry, is recommended if you want to pursue a profession in the chemical sciences. The standard track, which offers more latitude in course selection, is appropriate for students who plan to pursue one of the health professions* (medical, dental, veterinary), public school teaching, technical sales, or other chemistry-related fields. For your first two years, requirements are identical for the two tracks. All students are required to take two courses each in calculus and physics. (If you’re planning to go on to graduate school, we strongly urge you to take additional advanced courses in chemistry, mathematics, physics, and biochemistry while at Clark.) You’ll also be required to demonstrate competence in communicating chemical concepts (for example, through reports based on research in the chemical literature, Academic Spree Day or Fall Fest presentations, directed study papers, honors theses, or publications), as well as take a standardized undergraduate chemistry knowledge diagnostic exam before graduation. Tutoring in chemistry is available, free of charge, five days a week. If you’re considering a career teaching chemistry at the high school level, we encourage you to check out the Noyce Scholarship program. A robust Pre-health Advising Program is available if you’re interested in pursuing a career in the health professions. The American Chemical Society Undergraduate Award in Analytical Chemistry is awarded to an outstanding student who has displayed an interest and aptitude for analytical chemistry. The American Chemical Society Undergraduate Award in Analytical Chemistry is awarded to an outstanding student who has displayed an interest and aptitude for physical chemistry. The Organic Chemistry Prize is awarded to an undergraduate student for his/her outstanding performance in organic chemistry. Solve problems that require the analysis of unknown substances or the synthesis of new molecules or materials. Collaborate efficiently and productively with colleagues in other fields, such as biology, physics, materials science, environmental science, or biomedical engineering. Read primary literature critically, analyze complex data, and identify relevant trends. Communicate information effectively, both orally and in writing. Learn about our facilities and equipment available for teaching and research, and the resources at Clark’s Carlson Science Library. At Clark, your education extends beyond the classroom. LEEP Center advisers can help you choose from a range of opportunities that complement your coursework and put your chemistry knowledge into practice. The chemistry major is designed to help you learn outside the classroom. 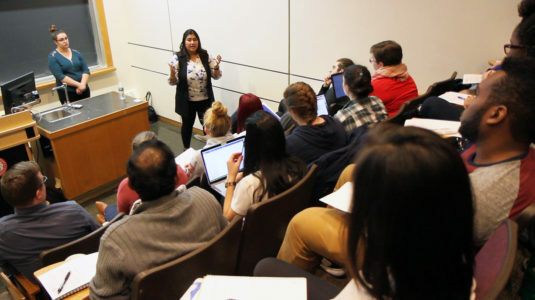 Many students take advantage of internship opportunities during the academic year or over the summer to connect what they’re learning with their professional development. Clark is committed to action-based learning, which means that as an undergraduate you can join faculty and graduate students in their research. Our faculty members have research interests in these subfields of chemistry: materials chemistry (including bio-inorganic, bio-organic, biophysical, inorganic, materials, organic, organometallic, physical, and polymer chemistry), biochemistry and molecular biology, among others. The Chemistry Department is a supportive, collegial group of faculty, undergraduates, and graduate students. During the academic year, you can attend a weekly seminar and luncheon on a subject of current research interest. Most research groups also hold weekly meetings where you can exchange ideas and get feedback on research. You are also welcome to attend the department-wide Harry C. Allen Jr. Symposium each year. As a Chemistry major, you are strongly encouraged to undertake an original research project as an undergraduate. 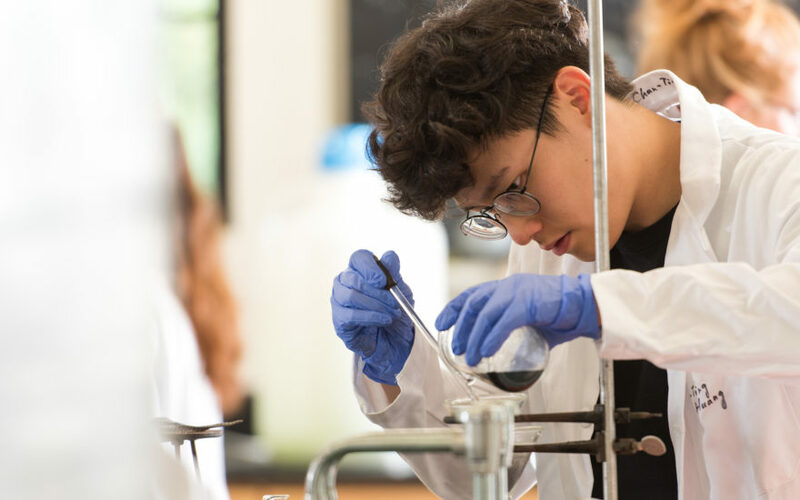 This gives you an opportunity to apply the knowledge you’ve gained in the classroom, improve the breadth and depth of your understanding of chemistry, and contribute to our collective knowledge of the world around us. You can conduct research as part of a course or internship, or participate informally in faculty research during your spare time. You also can apply for funding to support your own research on a project of your choice during the academic year or during the summer. Research involvement at this level provides you with an excellent background for future graduate work in chemistry, or a breadth of experience that will assist you in future work in the allied health fields, teaching, or other science-related fields. The chemistry major prepares you for a variety of exciting next steps. You might go on to graduate school to further your knowledge of the field, enter one of the health professions (medical, dental or veterinary), or become a public school teacher. Other career paths include product development; technical sales; marketing and communications; hazardous waste management; forensic science; chemical engineering; and intellectual property law. Massachusetts College of Pharmacy; Pharm.D. Tulane University Law School; J.D. Use diffraction and scattering techniques (including small angle and quasi-elastic neutron scattering) to investigate the structure and properties of a variety of biochemical, inorganic, and organic materials. Investigate the structure and properties of inorganic substances while contributing to a rigorous research project that aims to produce results of sufficient quality and quantity suitable for publication.